The OMEGA™ PXTX-4900 and PXTX-4901 transmitters isolate a 4-20 mA current loop from the 0 to +10 Vdc signal and the power line. 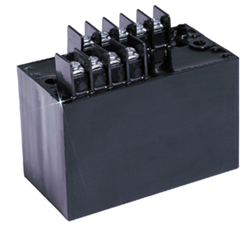 These units are ideal for eliminating ground loops and common mode signals. In the PXTX-4901, which converts 4-20 mA to 0 to 10 Vdc, the input resistance is less than 50 Ohms, generating less than 1 Volt drop at 20 mA loop current. The PXTX-4900 converts a 0 to 10 Vdc to a 4-20 mA output signal. For both models, the 400 Hz frequency response provides a settling time of less than 0.003 seconds to 0.1%, which prevents signal degradation. Both models are completely encapsu-lated for use in rugged environments. They are similarly protected against shock and vibration for years of reliable and accurate operation. All connections are easily made to conveniently located barrier strips.